A very popular tipster, @MMDDJ on twitter leaked the renders of the alleged Samsung A8s which had an unusual notch or you can call it a mole, its a cutout on the top left corner of the display in a circular shape. Today, Samsung confirmed that the Galaxy A8s will in fact sport the Infinity-O Display. An image of the same was posted by Samsung on Weibo which gave us an idea of what the display will look like and trust me it’s weird and amazing both at the same time. This new type of display is also known as ‘punchole’ display in the tech community. 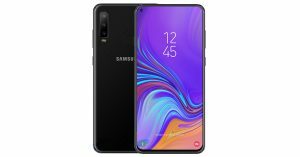 The Galaxy A8s will be the first ever phone to display the punchole. 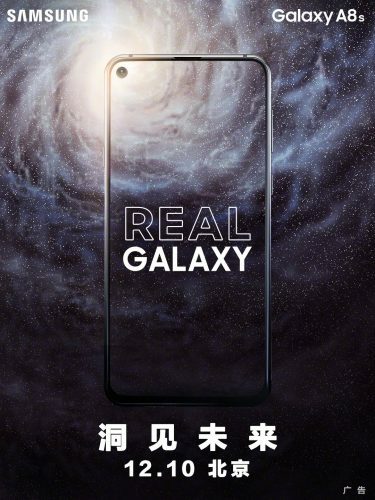 As per rumours, the same Infinity-O display is set to be the highlight of the upcoming Galaxy S10. 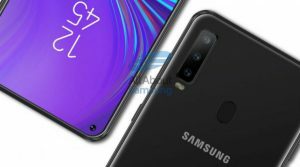 During the launch event of the Galaxy A9 and the A6 in China, Samsung teased the Galaxy A8 and they stated that the A8 will be having an in-display camera as well as the bezel-less design we were all hoping for since the start of this trend. The A8s is expected to be powered by the Qualcomm Snapdragon 710 which is getting a competition against the likes of Helio. P70. The processor will be coupled along with 6GB RAM and 128GB internal storage which will be expandable via microSD up to 512GB. As for the cameras, the Galaxy A8s will come with the triple camera module at the rear with a 24-megapixel primary lens accompanied by a 10MP and 5MP unit. As per sources, the Galaxy A8 will be packing in a decent sized 3,400mAh battery. The launch event is set to be on December 10. Stay tuned to Gadget Gig for more updates on the upcoming launch event of the Galaxy A8.